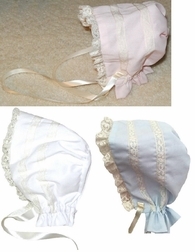 Peppermint Pony makes adorable heirloom bonnets to match their heirloom dresses and can be worn with other dresses or outfits to church, special occasions and just out with mom and dad. 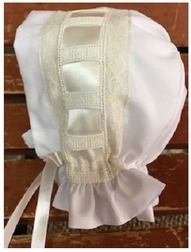 They are made with batiste cotton fabric in the same colors as the heirloom dresses and can be trimmed with either white French lace and satin ribbon or ecru French lace and satin ribbon. 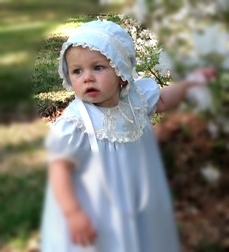 Order one of our bonnets to match your heirloom dress and complete the look!